The Alternative Investment Funds industry includes hedge funds, private equity, venture capital and real estate funds. Assets in hedge funds are mostly domiciled offshore or structured as limited partnerships in the US. Key domiciles for hedge funds outside of Europe are the US, Cayman, Australia and Brazil. The key domiciles in Europe are Ireland, Sweden, Netherlands, Guernsey, Luxembourg, France, UK, Finland and Jersey. Net Sales into QIAIFs were at a record level in 2017, almost double the previous high in 2015. Any asset managers wishing to market and distribute AIFs in Europe will now have to carefully consider the implications of the Alternative Investment Fund Managers Directive (AIFMD) on how they can approach the distribution of their funds in Europe. The location of the Alternative Investment Fund Manager (AIFM) and the location of the AIF to be distributed will have a direct impact on the extent to which AIFMD compliance will be required. All AIFMs located in the EEA whether they manage EEA or non-EEA AIFs fall within the scope of AIFMD. The AIFMD also captures the marketing within the EEA of AIFs managed by an AIFM located outside the EEA (non-EEA AIFM). Under the AIFMD, EEA AIFMs can now avail of a marketing passport to distribute AIFs within the EEA, similar to the UCITS Directive. The two types of AIFs which can be established are the Qualifying Investor Alternative Investment Fund (QIAIF) and the Retail Investor Alternative Investment Fund (RIAIF). QIAIFs are subject to a €100,000 (or equivalent in other currencies) minimum subscription requirement and can only be “marketed” (i.e. using the passport) to “professional investors”, There is a higher €500,000 (or equivalent in other countries) for QIAIFs which invest more than 50% of net assets in unregulated funds. *Dependent on assessment by European Securities and Markets Authority (ESMA) and European Commission (not yet concluded). The AIFMD passport can be used if a fund promoter has an AIFM based in an EEA member state with a European domiciled AIF or alternatively the fund promoter establishes an EEA domiciled self-managed AIF (which is authorised both as the fund and the AIFM). Since mid 2015 the Commission has been evaluating the possibility of allowing the use of the marketing passport for non-EEA AIFs. Non-EEA managers with funds may continue to be distributed in various European countries using National Private Placement Rules (NPPRs) for as long as they remain available for use. However, these NPPRs are constantly evolving across territories and are under assessment by the by the European Commission. This could potentially result in the phasing out of such NPPRs. 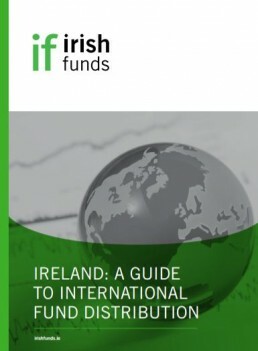 The AIFMD Passport – How does it work? The passporting procedure under AIFMD is similar to that which exists for UCITS funds in the EEA. Once an AIFM is authorised in one EEA member state, the passport permits the AIFM to market units or shares of any EEA AIF that it manages to professional investors in the home member state of the AIFM as well as any of the other 27 EEA member states. Without the need for additional authorisation, there must be a notification letter for each EEA member state in which the AIFM wishes to market its shares or units to professional investors. For passporting purposes, an investor must meet the definition of professional investor set out in the Markets in Financial Instruments Directive (MiFID). According to MiFID, a professional client is a client who possesses the experience knowledge and experience to make its own investment decisions and properly assess the risks that it incurs. Furthermore, in the case of an AIF structured as a Master / Feeder, the Master must be domiciled in the EEA in order to avail of the passport. 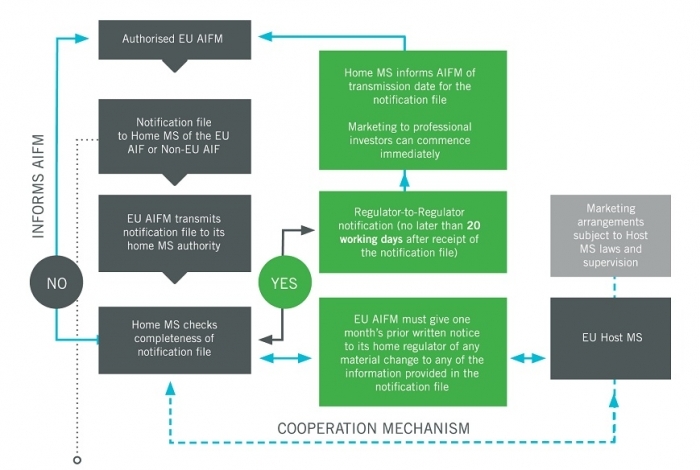 The AIFMD states that within 20 working days following receipt of a complete notification file, the AIFM’s home state regulator will inform the AIFM if it may start marketing the EEA AIF. Where a positive notification is received, the AIFM can start marketing with effect from the date of receipt. The AIFM’s home state regulator can prevent marketing only if the AIFM’s management of the AIF does not or will not comply with the terms of the AIFMD or the AIFM otherwise does not or will not comply with the terms of the AIFMD. Some countries may require additional documentation in the form of a prospectus supplement or may have specific service providers specific requirements, such as a local representative and/or paying agent. Where relevant, information on arrangements to prevent the AIF from being marketed to retail investors. Including in the case where AIFM relies on activities of independent entities to provide investment services in respect of the AIF.